Business owners find new ways to engage customers and create a great connected experience. Now, commercial businesses are utilising digital signage totem kiosks. This is not just to provide better consumer experience, but also to have an edge over their competitors. That is why many kiosk manufacturers offer a variety of totems for these businesses to choose from. For kiosk manufacturers, the kiosk must have a reliable system ensuring that all applications installed can be used. And, all of its peripherals should have the capability to withstand harsh conditions. This includes unpredictable weather for outdoor totems and frequent usage of the general public. In any case, the S22 touch panel PCs can be a suitable computing solution for digital signage totem kiosks. And, these devices have high definition resolution with projected capacitive touchscreen features. Now, how can these industrial computing devices optimise the functions of these kiosks? Learn from this blog the various features of these industrial computers for digital totems. Nowadays, almost all industries are now converting to digital. And, this includes business and advertising agencies. In fact, digital signage totem kiosks with touchscreen PCs are the latest and most innovative advertising media. It bears product information such as best buys, new products and purchase locations. As a result, consumers may now have a great shopping experience in terms of buyer’s journey and product availability. And, they can view clearer images from the kiosk and, its touch functionality provides ease of use. Thus, they can easily navigate an application on the screen monitor. To ensure that totems are reliable to use, this must bear industrial-grade components. One ideal computing solution by mounting the S22 industrial computer. With an Intel® motherboard processor, any application installed is compatible and functional. Advanced versions of graphics are displayed on this device. Another advantage of this industrial computer is that it is also resistant to the frequent use of the general public. It can even withstand smudges, scratches and vandals because it features projected capacitive touchscreen technology. Therefore, this device can perform its specific functions well. Business and advertising agencies used LED and LCD displays as a tool to attract potential customers. But, these devices don’t have the capability to interact with the consumers. As an end result, there is a minimal chance of getting new leads. These agencies are also unaware what the consumers really need. Unlike digital totem kiosks with a touchscreen feature, consumers can now input what they really want of a product or service. 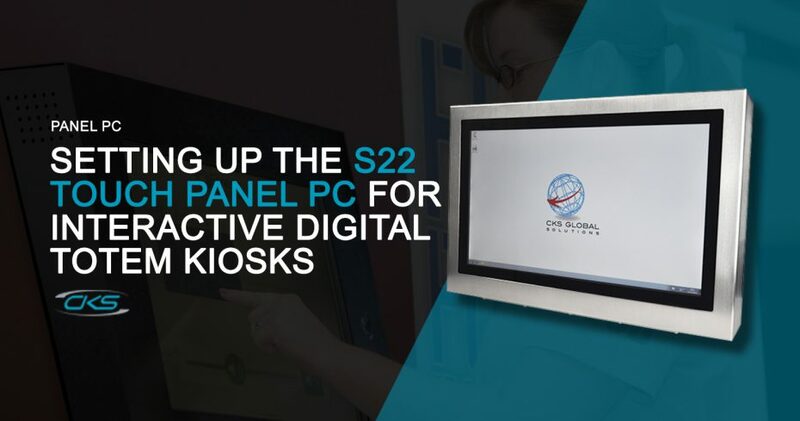 Here are the top reasons why the S22 industrial PCs are the recommended choice for these kiosks. Most industrial computing devices hold many programs at the same time. One conventional program is equivalent to one task. Whilst, a more modern program requires multiple tasks. These tasks are called threads which greatly affects the performance of central processing cores. But, these S22 industrial panel PCs support hyper-threading since it supports Intel® Core™ i7 processor. With this feature, performance is improved and efficient, particularly in a complex software environment like totems. Therefore, this device is generally a reliable computing system. The S22 industrial computers are weatherproof. Its environmental conditions range from -5°C to +50°C operating temperatures. This only means that it can withstand winter’s freezing point and even the hot summer days. Furthermore, these computers are also enclosed in a stainless steel construction frame. So, the internal parts of the system are protected. Rest assured that it can still work effectively despite the unpredictable weather. Kiosks can either be placed indoors or outdoors. But, whichever it may be, this must have high-quality image displays. Good thing is, the S22 industrial PCs have full HD screen resolutions. Pixel ranges from 0.9 to 20mm with deeply saturated colours and no image retentions. This allows consumers to view crystal-clear images and videos even if there is lack of lighting. A strategic partnership with shopping malls and venue owners can generate revenues from advertising. But, providing more advanced totems can ensure to create a great consumer engagement. So, install the S22 touch panel PCs in these kiosks today for a better consumer experience.